BECOME is a Center for Community Engagement and Social Change. Through culturally responsive evaluation, research and community development, we seek to cultivate a socially just world. Nourishing communities affected by poverty and injustice to make their vision of a thriving community a reality. We do this by drawing on cultural strengths and building community capacity to create the conditions necessary that help communities design their own solutions. Thriving communities where… young people aspire and achieve their dreams; neighbors know, trust, and look out for each other; previously incarcerated are welcomed back and supported; members have the economic resources to meet and surpass their needs; the people have a stake in the common good; community members draw on resilient bonds of solidarity in confronting injustice and inequity; the community as a whole takes its destiny and well-being into its own hands. To become means “to begin to be,” and being something shows up in both presence and action. The end result of becoming is the full manifestation of our hopes and dreams.For a person to become something, they must adopt a certain mindset, then take action to manifest their vision. BECOME reflects its board and staff members’ mindset and collective action to help marginalized communities become places for healthy, thriving people. People and communities already have the power and potential to create the conditions they seek. Our role is to facilitate and support their actualization. We need to speak and live the whole truth for healing and lasting social change to happen. No person or organization can realize social change and fulfillment alone. We must come together in unity. The underlying factor for real and sustainable change towards equity and flourishing is love. When love is the driver, we all move forward. The best work is needed for people to flourish and reach their potential, so we strive for excellence. Our core philosophy is that the community must be at the heart of identifying their capabilities to address their challenges and to create their desired reality. People in communities around the world have shown great resilience in the face of grim and often painful circumstances, such as poverty, violence and health disparities. Despite their resilience, there has also been a cost to pay either financially, physically, and/or emotionally. Many have wondered … what are the sustainable solutions? Culture is the fabric of life, the theme that runs through humanity. Culture is how people in a group relate to themselves, things, and others, as influenced by shared norms, values, language, beliefs, practices, rituals, and traditions. It often guides behaviors, cognitions, decisions, institutions, and governances. Taking into account the culture of the people, institutions and communities involved in the evaluation or project is essential to understanding the people and context for change. Just as there is an innate ability inside of the caterpillar to know how to transform into a beautiful butterfly, we believe that individuals have the answers to transform their communities – and by extension, the broader society – to become socially cohesive, physically healthy, emotionally intelligent, and financially stable. 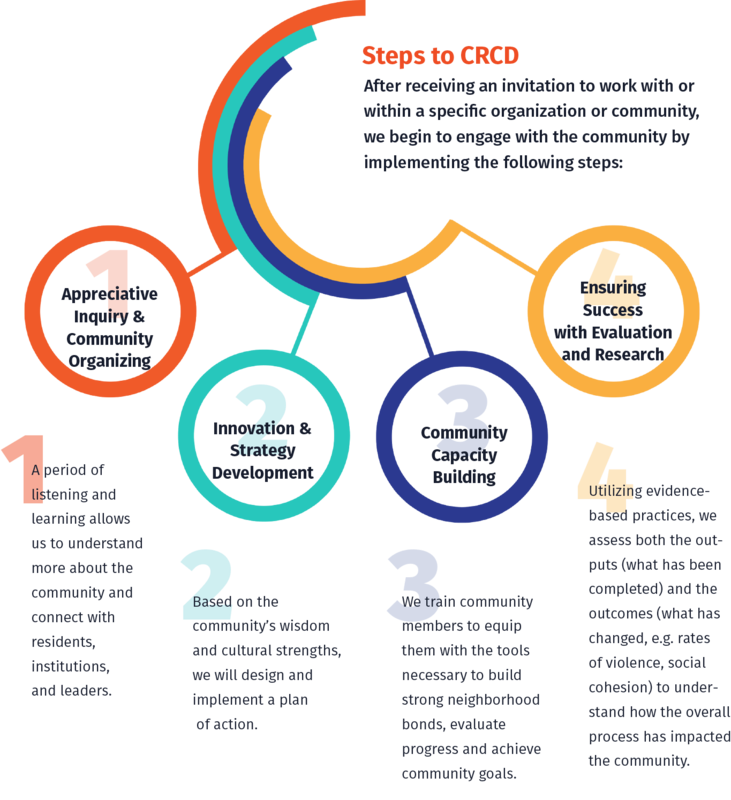 Our revolutionary approach to community transformation is called Culturally Responsive Community Development (CRCD). We believe the community has the answers to solve the community’s problems. By building relationships with community members, we work on three levels community/resident groups (e.g., block clubs), institutions (e.g., schools, churches, community centers, hospitals, police), and decision makers (e.g., alderman, mayor, state reps). Through this model, we concentrate all of our services in a neighborhood and partner with them for the long-term until their vision of a thriving community is realized.